1. Heat butter in a pot. Add flour and stir to make a roux. Whisk in clam broth. 2. Pour in water and bring to a boil. Stir in fried potatoes. Lower heat and simmer for another 10 minutes. 3. Add clams and shrimp. 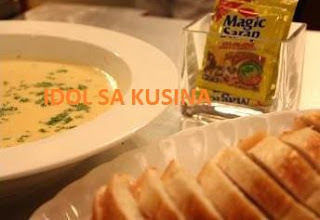 Season with MAGGI MAGIC SARAP and simmer gently for 2 minutes. Add All Purpose CREAM and cook for 2 more minutes. Season with salt and pepper to taste. Serve with crusty bread.